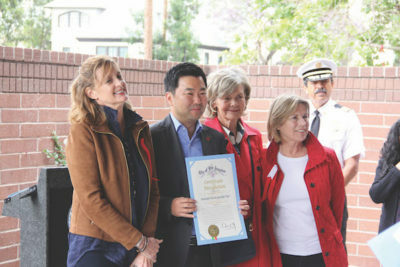 HANCOCK PARK Garden Club is thanked by Councilman David Ryu for its contribution to the Centennial Garden project at local Fire Station 29. Accepting are, from left, Garden Club members Julie Grist, Jennifer Fain and Helen Hartung. Observing at right is City of Los Angeles Fire Chief Ralph M. Terrazas. Neighbors marked the success of a local fundraising campaign led by Lyn Mac-Ewen Cohen and the First-In Fire Foundation, of which she is the founding president, on a drizzly Saturday morning, May 12. 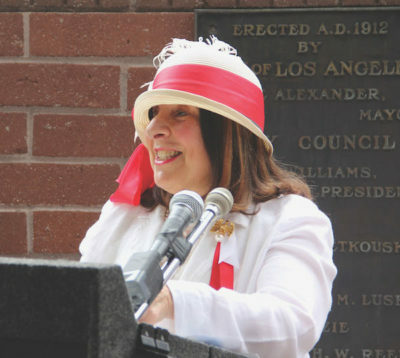 A large gathering of neighbors rallied at Fire Station 29, located in Windsor Square, at the corner of Van Ness Ave. and Wilshire Blvd., to kick off the construction of the “Firehouse Centennial Garden” that will improve the look of that corner for firefighters and the community — and will do so with drought-tolerant, native plants. It also was Fire Service Day, and numerous leaders from the City of Los Angeles Fire Department command staff, including Chief Ralph M. Terrazas, participated in the ceremonies. Councilman David Ryu said that he and the Fire Chief planned to visit several other Council District 4 fire stations later in the day, but both made it clear that this first visit was very special. Fire Station 29, previously located on Western Avenue, has served the Mid-Wilshire part of Los Angeles since 1912. The local “Friends of Fire Station 29” has provided financial support for the past several decades. LYN MACEWEN COHEN, president of the First-In Fire Foundation, was made an Honorary Fire Chief at the groundbreaking ceremony for the new, drought-tolerant garden. This $85,000 project to beautify the station’s landscape, led by the First-In Fire Foundation, also has received significant financial support from the Hancock Park Garden Club, Loveland Carr Properties, Windsor Square Association, Greater Wilshire Neighborhood Council, Hancock Park Homeowners Association, Fremont Place Association and numerous others. Landscape services have come through Studio-MLA and Nature-Scape. Rebecca Schwaner of Studio-MLA contributed the garden design as a way to thank firefighters. She and Sasha Shipman were present to be recognized. Additional contributions are needed to reach the final goal. You can learn about donating at firstinfirefoundation.org.